PMKS Why Don’t Men Cover Their Faces? Musically speaking, PMKS have approached this latest release from a totally new angle. A thick, retro beat and backdrop emerge among a uniquely rhythmic track that showcases a more electronic rock aura than anything that came before. Regarding the song in general though, the set-up of the music isn’t the thing that’s likely to draw an audience in initially – more likely, it’s the song’s title, the artwork, and the subsequent implication of its concept. PMKS have always taken to discussing current events and issues within their music – it’s the punk rock way, and there have been so many different topics covered by the band in recent years. This latest single is far from surprising to those who’ve heard their music before. As suggested, the sound is different here, slightly more delicate – the electronic chord progressions and the big beat create something softer and less raw than the more commonly featured, distorted guitars and weight. Having said that, you can still tell it’s PMKS – Spike’s voice is unmistakable, even in this setting, and even with this notably more subtle and emotionally genuine performance style. As a lead singer, he’s approached this in a distinctly heartfelt way, and that’s something you can hear more and more as the song progresses. The question posed by the song is one that might call upon readers or potential listeners to react in a certain way, (or to even go ahead and Google the answer, if you aren’t entirely sure). In reality, when you listen to the lyrics, the song isn’t simply about asking that question, it’s about expressing a level of empathy, and a sadness at the lack of such empathy from men in certain cultures. 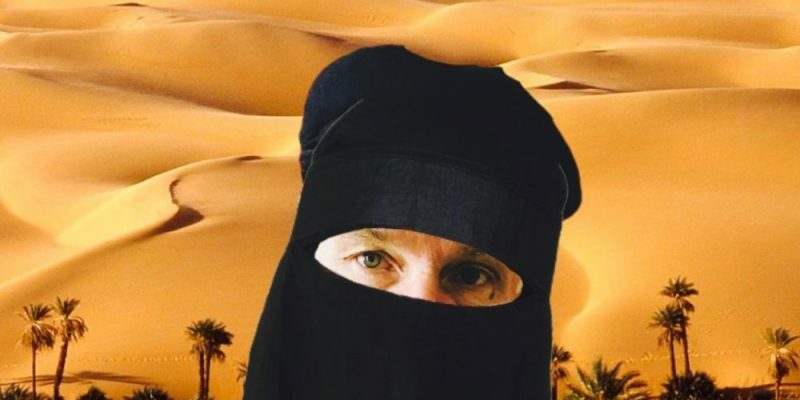 The music has been thoughtfully structured and the latter half really creates a reflective cavern of consideration that works well in the lead up to the final verse – one that does quite directly address the topic or issue of the Niqab. PMKS are a band with extensive experience of living in a country in which women have been forced to cover their faces, so to draw inspiration from this makes sense, and as stated – the band never shy away from writing creatively about things that play on their minds. Find & follow PMKS on Facebook, Twitter & Instagram.